Veet’s new Suprem’Essence hair removal wax strips enriched with Velvet Rose and Essential Oils certainly make some big promises. These new wax strips claim they will leave the skin moisturised after use and smooth for 4 weeks. Other promises include being effective on hairs as short as 2mm, being quick and easy to use and to top things off they say their wax strips are delicately scented, meaning they don’t smell of that potent hair removal aroma. In terms of application these strips are extremely user friendly and perfect for virgin waxers and experienced waxers alike. Simply rub the wax strips between the hands to warm before peeling apart the strips and placing one onto the skin. Rub repeatedly in the direction of hair growth and then whip it off in a flash. We are pleased to say you don’t even have to grit your teeth because the removal is pain free even for those of us who were sporting rather unkempt leg hair before waxing. The strip can then be reused repeatedly until it looses its grip. After the removal our legs were looking very smooth and almost polished thanks to the lovely scented finish wipes (no strong hair removal scent) which are included to remove the excess wax. In terms of living up to the other claims, even those of us with relatively freshly shaved legs with between one and two days of regrowth found that it removed all traces of even the most minuscule hairs. Overall we covet these fantastic wax strips, however our one criticism was that, as with most things in life there simply isn’t enough of them! The pack includes 18 wax strips and 4 perfect finish wipes which is probably enough to do the bottom of your leg and perhaps a smaller area such as bikini line or underarms but if your looking to wax the whole leg and other bits’n’bobs then you may need more than one box. 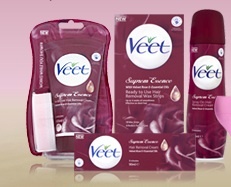 Veet Suprem’Essence wax strips are available to purchase from Boots and are priced at £6.34. If you would like more information on the Veet Suprem’Essence range then you can visit the website here. NARS Multiple Tint E45 Endless Moisture Radiance - for naturally radiant skin.